"The Polish visit showed the profound reason why a decade of Vladimir Putin's leadership has resulted in Russia's deep international isolation"
Ten years of absolute power and 10 years of unlimited sycophancy have not failed to leave their mark on Russian Prime Minister Vladimir Putin. He has completely lost the ability to listen to others or to hear himself. This isn't a problem in Russia, where he controls everything. And it isn't generally a problem in the West, where when people don't fully understand you, they just nod and smile as long as you don't try to take away their morning roll. But Poland is not the West. The West knows communism, but Poland feels it. Poland knows how it tastes, how it smells, what it feels like. Poland knows how prison-camp gruel tastes, how gulag latrines smell, what it feels like to have a pistol barrel put to the back of your head. What good is Putin's criminal vagueness in such a place? A thousand Ciceros could not convince the Poles that the stale roll of the Molotov-Ribbentrop Pact contained even one single raisin. "If we speak about the objective evaluation of history, then we must understand that it does not have a single color. It is multihued and an enormous number of mistakes were made by many sides. And all of these actions, in one way or another, created the conditions for the beginning of the massive aggression of Nazi Germany. This is what we have to work on if we want to see an objective picture. And if someone decides to try to take this old and rotten roll and pull out some sort of raisins for themselves and leave all the mold for others, then nothing good will come of this." Dear reader, do you understand this newspeak? Let's check. What is "the objective evaluation of history"? Is it a computer-integrated compendium of the historical works of America, England, France, Poland, Estonia, Russia, China, and Zimbabwe? Not at all. "Objective" is what the Kremlin says. And what does "we must understand" mean? Who is this "we"? Putin and President Dmitry Medvedev? Not at all. We say "we," but we mean "you." After all, we already know that "history does not have a single color." Sadly, you don't, but you must! And how would we translate the newspeak term "a single color"? This means that you can't say that Stalin's executioners shot -- without an investigation or trial, without the slightest indication of guilt -- 20,000 unarmed interned (they weren't prisoners, since there was no war!) Polish intellectuals. Saying such things would be to smear history with one, unpleasant color. It means that, for the sake of a rainbow of objectivity, you must also mention the Red Army prisoners in the Bereza Kartuska prison, and the Pilsudsky-Whoever pact, and the 17th-century False Dmitry too (since we haven't forgotten where he came from!). And it is on this entire mixture that, as Putin told the Poles, "we [that is, you] have to work." Did he think he was talking to idiots? And these flowers "not of one color"? And Putin's "old and rotten roll"? Well.... Here I'm afraid I have to admit something that I usually try not to admit. Readers have no business knowing how much time and effort an author expends searching for the right words. Even in the best restaurants of Paris, the general rule is not to let the diners into the kitchen. But Putin's "rotten roll" is a completely unique case. I have already spent half an hour trying to find a brief and precise definition. I have been struggling with terms and epithets, but each time I give up in despair. How much was expressed in this unique baked good! The term contains the orator's blinding ignorance: after all, history does not contain stale rolls. Everything that has happened to us is eternally fresh bread. The term contains unimaginable spiritual petrifaction, since 1939 is a fresh, open wound for the Poles. There are no raisins, no mold in the dissection of their country -- only rivers of the blood of their families that are not only remembered, but are still running scarlet and steaming. The term contains political insensitivity: after all, the speaker is not just out enjoying a nice fall day, but is marking the anniversary of the treacherous attack of the country that he heads on the country in which he is a guest. The term contains political shortsightedness: it is foolish to try to build relations with one of the largest countries of Europe on a foundation of caustic, poisonous comments. And the term contains the ultimate regal narcissism. A man who is used to pontificating in vulgar terms before listeners enraptured by his oratory found himself at a loss in front of a completely different audience. Seventy years ago, Hitler and Stalin -- with their bloody fangs bared -- rushed to devour Poland. Stalin has a formal successor, and that is (if we forget for the moment about Russia's dubious duumvirate) Putin. 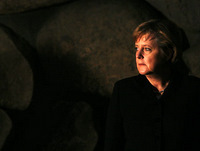 Hitler also has a successor -- German Chancellor Angela Merkel. You've already read about Putin's roll -- but what did Merkel have to say? "I bow my head before the courage of the victims of the war," she said. "Of course, we understand that these scars will remain for a long time. We, Germans, will never forget about our partners in the East and the West who laid the groundwork for the resurrection and restoration of relations. And never again in the future will we ever even think about again in any way proceeding down the road that Germany chose so many years ago." Doesn't it seem to you that Merkel is smearing the history of her country all in one color? "We will never forget...." "Will never even think...." "In any way...." What on Earth could she be thinking? Why didn't she trot out the full spectrum, like Putin? Take, for instance, this color: before unleashing his tanks, Hitler spent half a year trying to persuade the Poles to allow him access to Gdansk, which was then called Danzig and where they spoke German a lot better than, say, the people of Lviv speak Ukrainian. William Shirer, the American journalist and author of "The Rise And Fall Of The Third Reich," was present in Berlin on September 1, 1939, when Hitler gave a speech about the beginning of the war, and even years later he marveled at how convincing it was. Goebbels had built up a whole dossier of Polish perfidiousness, the plausibility of which was comparable to anything Soviet agitprop produced. You can see what bright colors Merkel rejected, to say nothing of the raisins she missed out on. Even back when he was president, Putin was distinguished by his tireless attempts to manage history. It isn't just a passing fancy. Putin really doesn't understand that presidents and prime ministers are just temporary and sometimes accidental managers who don't have any right to command astronomy, chemistry, philology, or other fundamental sciences. He really does not know that scholars are not responsible for how people use their discoveries. He does not see any difference between history as transient propaganda and history as a scholarly discipline. That is the source of the sincerity that often confuses people who aren't schooled in Putinesque newspeak. "The State Duma of the Russian Federation, the parliament of our country, has condemned the Molotov-Ribbentrop Pact," he reported in Poland, not without a hint of pride, simply in order to bring forward another demand. "So we have the right to expect that other countries who made deals with the Nazis should do the same, and not just in the form of statements by political leaders, but on the level of a political decision." Of course, the world remembers perfectly well the torturous process of exposing and then renouncing the secret pact, first in the Supreme Soviet of the USSR and then in the Duma under President Boris Yeltsin. There is plenty to be modest about in that story. But for Putin the important thing is to look better than the other countries "who made deals." Can you think of another country, besides the Soviet Union, that signed a secret deal with Hitler divvying up a slew of neighboring countries and then, in a military alliance with the Nazis, launched World War II? If Putin knows of one, let him name it. If not, then let him explain which other countries should "do the same." And why can't this "same" be done on the level of statements by political leaders? And what, exactly, are these "political decisions" that should be made by, say, Poland? It was Poland, Putin gleefully recalled, that in 1938, "if my memory doesn't deceive me," occupied two regions of Czechoslovakia in the wake of the Munich Agreement. And even before that, our teacher could not resist mentioning, Poland took Silesia from . "Hitler did not forget or forgive that," the national leader of Russia said, concluding his historical essay. He didn't mention whether the governments of Germany or the Czech Republic had authorized him to settle these bilateral issues that don't concern Russia in the least. In our skirmishes with those foreigners who want to blacken our history, the figures of our wartime losses have always-- and still -- given flight to political inspirations. Of course, they never make any distinction between those who fell because of the efforts of Nazi tank commander Heinz Guderian or because of the incompetence of Soviet military commander Kliment Voroshilov. 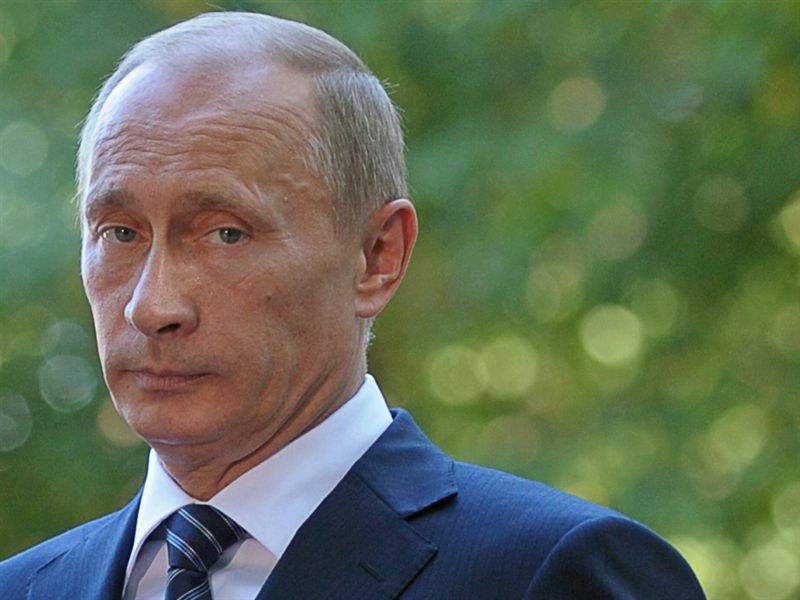 Putin continued the Soviet tradition of rounding off the numbers of victims in convenient ways. "More than 53,000 soldiers and officers of the Red Army gave their lives just in the battle to liberate Gdansk," he said. "Six hundred thousand of my countrymen are buried on Polish soil, people who advanced the cause of victory over fascism. Six hundred thousand! In all, of the 55 million people who were killed in World War II, more than half were citizens of the USSR. Think about these horrific figures." During the war, Poland lost 17.5 percent of its prewar population. 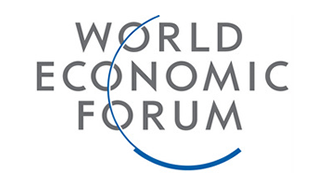 That is more than Germany (7.2 percent) or the Soviet Union (15.3 percent). 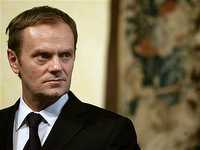 But Polish Prime Minister Donald Tusk preferred to avoid morbid comparisons. "No one in Poland has forgotten or will forget how much blood remains on our land of Soviet soldiers who liberated Poland from Hitler's occupation," he said. 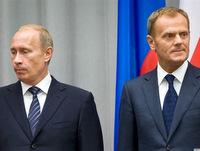 Putin, of course, saw with his own eyes in what immaculate condition the graves of Soviet soldiers are kept in Poland, and he nodded to confirm Tusk's words. "Soviet soldiers in 1945," Tusk continued, "liberated our land, but they were not able to give us freedom because they didn't have it themselves." Putin met these words with a stony expression. It would be nice if all that Putin said during his two days in Poland could be explained by his weak oratorical gifts. But this isn't just a matter of bad improvisation on inconvenient topics. The Polish visit showed the profound reason why a decade of Putin's leadership has resulted in Russia's deep international isolation. If it weren't for the bombs we inherited or the gas that God granted us, everyone would have simply stopped talking to us altogether. Russia's foreign policy is a dead end. In other words, Putin is doing something he does not know how to do. Lord Acton reminds us that "absolute power corrupts absolutely" -- so we can be sure that Putin's Polish syndrome won't end now that he has returned from Poland.